FAQs: Why Doesn’t This Skein Look Like That One? I was having coffee the other day with a friend who is knitting a pair of socks in SpaceCadet Oriana yarn in the colourway “Honey”. It’s a lovely tawny-gold, perfect for bright summer days, and her project looks beautiful. But she pulled her yarn out of her project bag and asked, “Is this different from the last skein of Honey I got from you? It looks different…” And she turned the ball over in her hands with a puzzled look on her face. Mmmmm… I love do Tickled — that’s the colourway above and it’s such a juicy, vibrant shade! So, which one of these skeins is Tickled? They each look different but the answer might surprise you… it’s all of them! 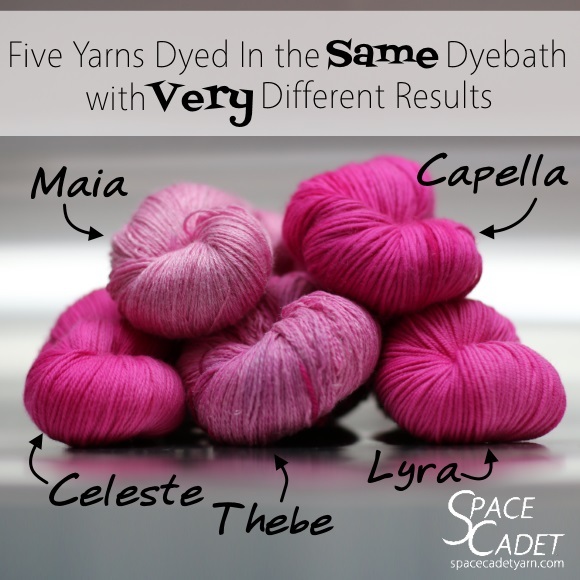 This is a photo of five different SpaceCadet yarns, each with a different fiber content or yarn construction, and all dyed together in the exact same dyebath — and look how differently they’ve all come out! Can you guess which yarns you’re looking at? Most people don’t realise how much of a difference the fibers a yarn is made from and the way that yarn is spun make to how that yarn takes colour. One yarn drinks in the dyewater as if it’s been stuck on a desert island, and another tries to pretend the dyebath doesn’t exist like a kid with his eyes squeezed shut and his fingers stuck his ears. And that means that, as a dyer, I have a choice: I can either try to rework the recipe for every colourway on each individual yarn or I can keep the recipe the same across all the bases and allow each yarn to take the dye the way it comes naturally. Well for me, the answer is easy. Unlike commercial yarns, it’s the nature of hand-dyed yarn that each skein is distinctive and individual, and so it just feels right to go with that and embrace the different way each of the bases takes on dye. I never get tired of seeing a batch of mixed bases come out of the dyepot and just falling in love with each yarns individual beauty. And after they’re dry, I love combining different yarns in the same colourway and seeing how those differences contrast and combine in my knitting. And Capella, our delightfully squishy single-ply worsted in 100% Superwash Merino. Let’s go back to the coffee shop with my friend, who was still looking quizzically at the yarn in her hands. I explained that the yarn she was holding is Oriana, which has eight plies that soak up dye deep and fast. That’s very different from Lucina, the last SpaceCadet yarn she worked with, which has similar yardage but is constructed from only two plies — meaning each ply has to be much thicker. The difference in the way these two yarns take on dye is sort of akin to the different ways a paper towel versus a cotton ball might soak up a spill. 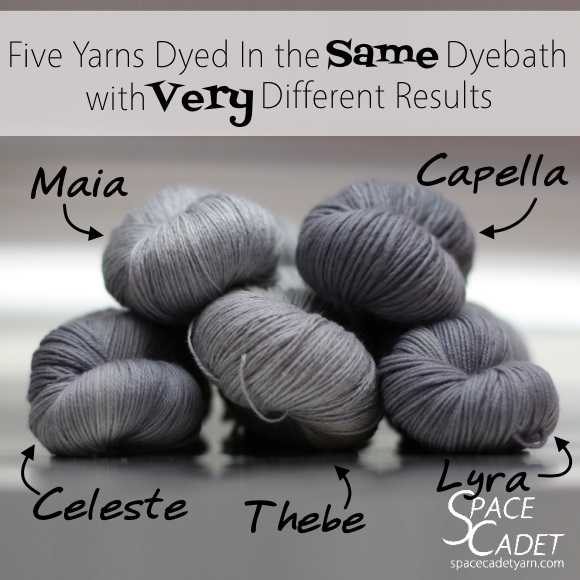 And so even though both Oriana and Lucina are dyed in the same recipe — and might even have been in the same dyebath — the results can be noticeably different. This entry was posted in Blog, Questions and Answers, Resources, Resources: Posts about Hand-Dyed Yarn. Bookmark the permalink. Announcing our Exclusive SpaceCadet Project Bags by Knerd! I really like the new look. It’s fresh and more……real? The colors pop, and I feel more engaged, like I’m really interacting with you. Just one gal’s opinion!